!! The Bohemian Embassy has arrived !! Look what has landed on Queen West! I have written previously about the terrible tackiness that is seeping into the trendy, dare I use the word “bohemian” Toronto neighborhoods of Queen West and Parkdale. But I actually feel uncomfortable using the word “bohemian” now that it has been co-opted by this new condo development, because if Rent hadn’t wiped all meaning from the word, it is now officially dead. Who is that woman on the billboard? Is this aspirational living? To what would we even be aspiring if we wanted to imitate her? The creators of the ad have come up with a never-before-seen synthesis of goth-raver, Russian mail order bride, Suicide Girl, and Ren-Fair Queen that is perhaps the least enticing figure imaginable. If you go to their website, you will see their slogan is “Be Scene. Be Free. Be Original.” Cutesy misspelling aside, she is definitely a true original, but unfortunately it is the kind that everyone avoids at parties. 9 Comments on "The Bohemian Embassy has arrived"
Was your gallery doing a photo retrospective on Russian prostitutes circa-1991? Best sign I’ve ever seen on West Queen West. It helped bring lots of people to my gallery. Thanks Boho. I was at the launch party last night because my sister works at II by IV Design Associates. “Bohemian” is definitely not a word I would use to describe the guests at the party, but the model in that picture was there in costume. The design of the place is actually quite contemporary. I wonder how much the ad company paid the girl to show up in the same costume as in the picture, but once I saw her I had to laugh. All you art bums who didnt graduate from OCAD or couldnt afford to go cuz you spent all your money on pot should go out and find a REAL job. Oh but the Bohemian Embassy has not existed in THIS form. The woman on that billboard has never existed before as far as I can tell. I think they are entirely co-opting the term and it has nothing to do with what they are trying to insert into the neighborhood. That said, you are right that it’s turning into hipster hell around here, but alas, it’s the normal chain of events for a formerly crappy neighborhood. I personally try to stay cooler than the cooler-than-thous. What does that make me? Truly cutting edge? The irrepressible self-righteous trendster banter aside, this development isn’t entirely coopting the word bohemian. 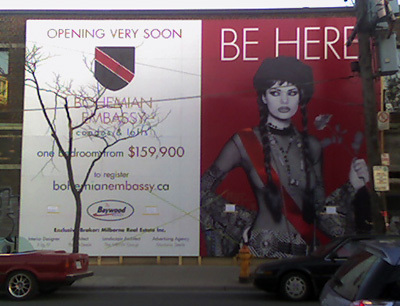 The Bohemian Embassy has existed in Toronto since the 60’s when it was a coffeehouse. I’d argue that our city is more polluted with ‘bohemian’ elitism coming from the cooler-than-thou’s populating your neighbourhood right now, and not from another condo development. And let’s not forget the Pippi Longstocking element. Those braids! Mm, but she is a bit too slutty-looking to be entirely boho. There is also a gothiness that doesn’t quite fit. I’m still puzzled. i believe the word you are looking for is BOHO.